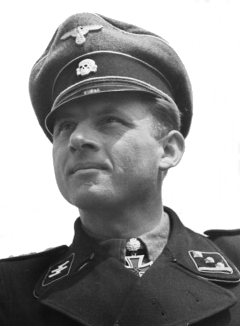 MICHAEL WITTMANN (1914-1944), proud son of the Bavarian village of Vogelthal and winner of the coveted Knight’s Cross with Oakleaves and Swords, has long been seen as one of the greatest, if not the greatest, exponent of the art of armoured warfare. Not just in the Second World War, but the modern era. On both on the Eastern front and in the West, Wittmann had made a name for himself with his exceptional skill and bravery. Highly respected by his colleagues and superiors, he was also acknowledged after the war by many of his former enemies. Having established his reputation on the Eastern Front, Wittmann’s exploits during the Normandy campaign of 1944 created a legend. Wittmann’s most famous moment took place on 13th June 1944, at Villers-Bocage. The Allied invasion had turned the tide against Germany, but on that day one man would do his best to delay the inevitable. Michael Wittmann was killed in the field on 8th August 1944. His final battle has long interested historians, as have the battles he fought during his career. Many articles and books have been written, but this is the most extensive dedicated resource on the web. Like many others in the Waffen-SS, Michael Wittmann was posthumously tarred with the sweeping brush wielded at the Nürnberg courts. Unlike those of his colleagues who would survive the war, Wittmann was unable to defend himself. No evidence has ever been found connecting him with war crimes, and like many of those who fought in the elite Panzer divisions, he was guilty of nothing but doing his duty. This site is not an attempt to whitewash the wartime record of the Waffen-SS, but to bring the contemporary historical record in line with the facts. Wittmann, like many of his compatriots, had nothing to do with war crimes or atrocities. He was simply a soldier like any other – Ein Soldat wie die Anderen auch. This site is an historical resource, and is not representative of any political persuasion or ideological position. It is dedicated to all of the victims of the Second World War, among them Michael Wittmann and his crew.